What Is a Shotgun Start In Golf? "Shotgun start" is not a golf tournament competition format but rather the way a tournament begins. When there's a shotgun start, all the golfers begin play simultaneously, each group of four golfers teeing off on a different hole on the golf course. For example, Group A begins on Hole 1, Group B on Hole 2, Group C on Hole 3, and so on. And they all begin play at the same time after a horn sounds—or (rarely today) a shotgun is fired—to indicate the start of play. Usage examples: "The tournament on Saturday has a shotgun start at 9 a.m." "The shotgun start is at 9 a.m., so make sure your group is in place on the appropriate hole and ready to begin play." The term "shotgun start" comes from the first known use of such a starting format. As reported in the December 2004 issue of Golf Digest, Walla Walla (Wash.) Country Club head pro Jim Russell fired off a shotgun to sound the start of play to golfers waiting on tees around the course at a tournament in May 1956. If a tournament has a shotgun start, here's how it works: Say there are 18 groups of four golfers each entered in the tournament. Each of those groups is assigned to a different hole on the golf course. When golfers arrive, they are likely to find the golf carts waiting, each marked to indicate which golfers get each cart. The carts will probably be lined up in reverse order; that is, the carts for the golfers who are starting on No. 18 will be first in line. When the start time nears, tournament organizers tell everyone to get in their carts and head out to their assigned starting holes. And the great parade of golf carts, familiar at every tournament that uses a shotgun start, commences. 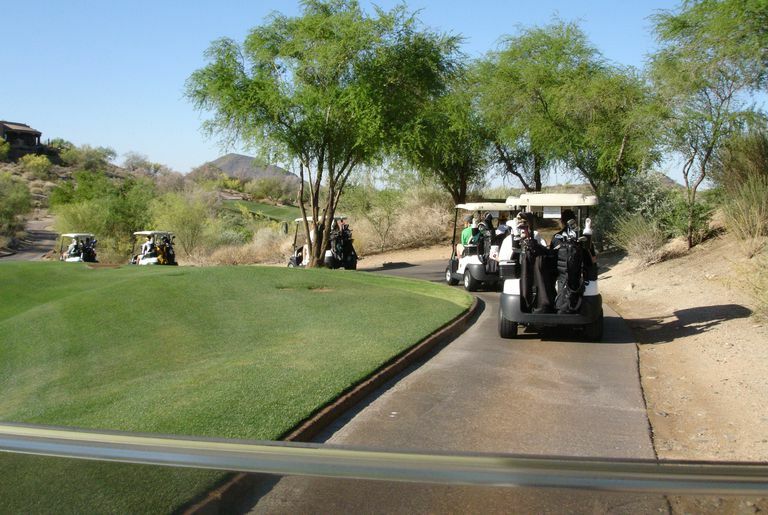 Golfers take off in their carts, stopping at the teeing ground of their assigned holes. And the groups—almost always four golfers to a group in a shotgun start tournament—then wait on their assigned tee box until they hear the starting signal. That signal is typically a horn of some type (such as an air horn), but could be anything else loud enough to be heard across the golf course. A loudspeaker atop the clubhouse. Even, yes, a shotgun blast. And upon hearing the starting signal, golfers on every tee box around the golf course begin play. The shotgun start is all about time management. A shotgun start means that all the golfers get underway at the same time, rather than teeing off at regular intervals from the No. 1 tee. Imagine the tee times are spaced 10 minutes apart. That means that it takes roughly 180 minutes for 18 groups of golfers to begin their rounds using such tee times. But with a shotgun start, those 18 groups all tee off at the same time. That means they finish earlier than in a tournament starting everyone from the No. 1 tee, and also that the groups all finish at around the same time, too. Shotgun starts are very popular with fundraising tournaments, corporate outings, association playdays and the like because of the time management benefits. And all golfers finishing around the same time makes it easier to get everyone into any follow-up activities (lunch, awards ceremony, etc.). In the examples we've used, we've talked about tournaments with 18 groups of four golfers each, one per hole. That's 72 golfers. But what if a tournament has more than 72 entrants? There's a way to deal with that and keep the shotgun start format. On the par-4 and par-5 holes, two groups start from the same tee, one after the other. Let's say Group A and Group B are both assigned to start on the par-4 No. 4 hole. When the starting signal sounds, Group A tees off. The golfers walk to their balls and play their second strokes. When the golfers in Group A are out of reach, the golfers in Group B tee off. In this way, a second set of golfers will get onto the same hole before the first is finished playing that hole. And extra groups get into the shotgun start. In this scenario, and in the one-group-per-tee scenario, a key for all golfers in a shotgun start is pace of play: Keep up with the group ahead! One slow group slows down the entire field. Why Do Golf Tournaments Sometimes Do the Splits?